In some cases, projects are launched with a clear problem statement and recommended steps to follow. In some other cases, the exact problem and way forward is not always straightforward. A clear example occurs when different people have differing opinions on the cause of a problem. In situations where stakeholders have multiple and diverging interests, the analyst faces the challenge of proposing a plan of action that all parties in the human activity system (the part of the organization where the problem lies) can live with. Centage Solutions had lost a lot of revenue during the past year. Fred, a business analyst, was called in to identify what the problem was and proffer recommendations. As a first step, he set up interviews with all the stakeholders concerned. Each stakeholder in turn, provided different reasons for the loss in revenue. The blame flew from one interest group to another. With everyone passing the buck and none willing to accept responsibility, Fred was bombarded with different definitions and probable causes of the problem. He found himself right in the middle of a highly political situation, one to which there was no easy answer or clear solution. What would you do in this situation? How would the analyst identify what the most pressing business need is? 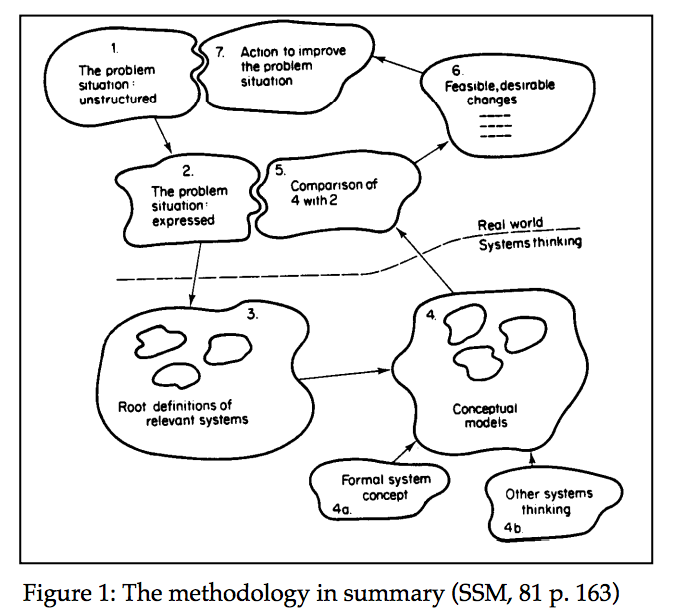 When faced with such a messy situation, it is all too easy for the analyst to solve the wrong problem; this is where soft systems methodology (SSM) comes in. SSM is an interesting concept that has stayed with me since my school days. This post is an introduction to the concept of SSM and how the analyst can apply it to resolving messy situations. SSM started as a modelling tool but is now widely regarded as a learning tool. It's not a technique but a "set of principles" that structure the analyst's thinking of the problem situation. It's a way of thinking about the real world (systems thinking), and its principles are centred on comparing the world as it is, with what it might be. The problem is poorly defined and the cause is unclear. The analyst digs in with the objective of: a) Identifying the problem and b) Proposing a course of action that is both desirable and feasible. The problem is unstructured, with different parties having different opinions on what is wrong and what can be done to solve the problem. Business analysis typically involves a negotiation process between different stakeholders. The role of the analyst lies in making sense of the messy situation by providing all the information and support needed by stakeholders to decide on the way forward. For more information on this methodology, here's a post on the practical application of SSM.